A large number of decorative plants are potentially poisonous for pets. In some cases, the simple contact with them can cause skin reactions, and in others it is eating them that does some sort of harm: from a simple rash to gastrointestinal trouble, neurological disorders, respiratory distress, or cardiac alterations. Although often the effects last only a few days, a severe poisoning can be fatal for our best friend. The level of danger depends on many factors, such as the dose, species, size of the animal, age, or previous conditions. The toxins might be in the leaves, stems, flowers, or fruits, ever present, or associated to a certain season, like poinsettias. Before buying a plant for your home, seek information about it. Be careful as well during walks, and prevent your pet from rubbing against or swallowing unknown plants. We need to be especially watchful with pups, for they nibble everything at hand, and are not exactly cautious with what they get into their mouths. In face of any symptom of poisoning, such as vomiting or disorientation, ask your veterinarian before you do anything, since the treatment might be different depending on the toxin, breed of the animal, and other factors. If you can, bring a picture or sample of the plant, so the veterinarian can identify it, and apply the right treatment more quickly. 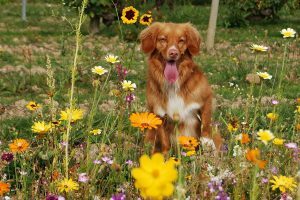 The range of plants that can to be poisonous for pets is so wide that there is no way to mention all of them here. Therefore, we have selected a few that we believe are found more often in our area. For detailed information about these and other dangerous plants, check the bibliography at the end of this article. Alocasia, or Chinese taro (Alocasia cucullata): Like caladium, alocasia owes its toxicity to calcium oxalates, so it is very irritating both by contact and ingestion. Aucuba, or spotted laurel (Aucuba japonica): Its most common effects are of a digestive nature. In big doses, though, it leads to neurological problems (trembling, spasms, disorientation), difficulty in breathing, and alteration of the cardiac rhythm. It might even cause internal hemorrhages, and damage to the liver and kidneys, which sometimes are mortal. Caladium, or elephant’s ear (Bicolor caladium): The whole plant is poisonous, and very irritating due to calcium oxalate crystals. Besides irritating the skin and eyes at contact, internally it causes also edemas, inflammations, and congestion. Chrysanthemum, and Pyrethrum (Chrysanthemum, and Chrysanthemum cinerariiaefolium, respectively): Their sale is forbidden in Spain since 2004 (BOE, in Spanish), so they should not be found too often. Cats are especially sensitive to them, compared to dogs. These plants can cause dermatitis, gastritis, and coordination difficulties. Dieffenbachia (Dieffenbachia exotica): It contains oxalates, too, so it can cause irritation of the gullet, stomach and intestines; inflammation; dermatitis, and conjunctivitis. Inflammation might develop into respiratory and cardiac distress. Golden pothos (Epipremnum aureum): It is similar to ivy, and its effects are quite alike, ranging from digestive discomfort to serious neurological problems, or even death. Holly (Ilex aquifolium): In the Mediterranean area, holly leaves or fruits are one of the most frequent causes of poisoning in animals. They lead to stomach and intestinal irritation, with vomiting, diarrhea and slobbering. In high doses it can reduce the cardiac rhythm, and induce coma or even death. Hyacinth (Hyacynthus): The bulb is poisonous. When eaten, it harms mainly the digestive system. Vomiting and diarrhea are the most common effect — sometimes convulsions and tachycardia, too. Ivy (Hedera helix): Its most poisonous part are the fruits, and to a lower extent, the leaves. It can cause digestive trouble, as well as spasms and quivers when it affects the nervous system. In large quantities, it might be fatal. Lantana or wild sage (Lantana camera): Its leaves and green fruits are very dangerous for pets. The mere contact is very irritating, and can cause dermatitis and severe internal inflammation, with resulting difficulties to swallow and breathe. In addition to that, they contain a toxin, lantadene, which can paralyze the biliary system, and lead to liver failure even in low doses. Lilies (Lilium): They are seldom lethal, but they do cause gastrointestinal trouble, and in the most serious cases, internal hemorrhages. Marijuana (Cannabis sativa): Since pets are smaller than humans, marijuana has more effect on them. They can experience digestive problems, cardiac alterations, disorientation, tremblings, and depression or sudden changes of humor. There are documented deaths due to cannabis, although it is not frequent. Monstera, Adanson’s monstera, or five holes plant (Monstera adansonii): Like several other plants in this list, it contains calcium oxalates. They are located in the leaves, stems, and flowers. The fruits are not poisonous, but the rest of the plant is, and very much. It causes severe discomfort, due to the oxalates’ effects on the skin, mouth, and digestive organs, whose swelling might cause serious difficulties to breath, and even cardiac arrest. Narcissus (Narcissus): Narcissus, as hyacinth, is especially poisonous when the pet eats the bulb of the plant. The effects are also similar: gastrointestinal disorders, trembling and, in the most serious cases, convulsions and alterations of the cardiac rhythm. Oleander (Nerium oleander L.): On contact, it can cause reactions in the skin; if ingested, digestive trouble, and vomits. In the worst case scenario, oleander induces respiratory and cardiac disorders, which might be fatal. Philodendron (Philodendron): Its toxicity is also due to calcium oxalates, therefore it has the same effects as dieffenbachia, caladium or alocasia, among others. Poinsettia (Euphoribia pulcherrimia): Their sap is very poisonous for some animal species. Pups and kitten are most vulnerable, as they are less aware about the stuff they eat, and their organism is more sensitive. In small doses, it causes vomiting, diarrheas and slobbering. In large doses, pets can experience quivers and ravings; or, in extremely severe — and infrequent — cases, even comma and death by multiple organ failure. On contact, it can cause as well irritation and inflammation in the skin and eyes. Rhododendron, and azaleas (Rhododendron): The toxin is in the leaves, and the flowers’ nectar. It causes gastric and respiratory problems, and might end in death. Sago palm (Cycas revoluta): this plant is especially dangerous, since it is mortal in a 50-75 % of cases. It can cause gastrointestinal distress, internal hemorrhages, neurological problems, and liver failure. The whole plant is poisonous — the seeds even more so. Savin juniper or savin (Juniperus sabina): Savin is very dangerous for pregnant females, due to its abortive properties. Generally, it can cause damage to the kidneys and digestive tract. Besides, it can irritate the skin and eyes. Cornell University, Plants Poisonous to Livestock and other Animals, searchable database that includes information about dogs, cats, and rabbits. Ivydene Gardens Wild Flower Gallery: Wild Flowers Poisonous Plants.